Rangers could offer Liverpool £2 million to tie up winger Ryan Kent on a permanent deal come January, according to reports. The on-loan Reds youngster has caught the eye for the Gers and is understood to be keen on commiting his future to the Ibrox side. Olivier Ntcham has handed Celtic a big boost by pencilling in a return to action next weekend. Hearts striker Steven MacLean could face a two-game ban following his clash with Celtic midfielder Eboue Kouassi. MacLean appeared to grab the Ivorian by the privates as they clashed at a corner during Sunday’s Betfred Cup semi-final. The Celtic player went off moments later but the incident was missed by officials. MacLean insisted after the game: “It was just a laugh. If I went down every time a centre-half niggled me I would be on my backside all day. Rangers chairman Dave King has stepped up his legal battle with Sports Direct and insists the retail giant owned by Mike Ashley will not have the “final word” in the long-running dispute over the Ibrox club’s kit sales. 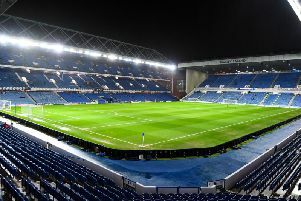 Last week the High Court ruled Rangers had breached the terms of an agreement with Sports Direct by entering into a new partnership with rival football merchandising firm Elite Group. Aberdeen will not demand an equal share of the tickets for December’s Betfred Cup Final with Celtic, according to reports. Talks were held at Hampden between the two clubs yesterday and although no agreement was reached, Dons chiefs are not thought to have pushed for a 50-50 split. Ex-Rangers coach lands new job? Jimmy Nicholl is on the verge of joining the coaching set-up at St Mirren after Oran Kearney reportedly called on his expertise. Nicholl was Graeme Murty’s assistant at Rangers last season before taking over as caretaker boss and now serves as Michael O’Neill’s No.2 with Northern Ireland.